I’ve had an affinity for this county ever since my student days. I suppose routes north through Lancashire are possible, but to me it made most sense to stay on the Yorkshire side of the Pennine boundary (more or less) before reaching the Dales. 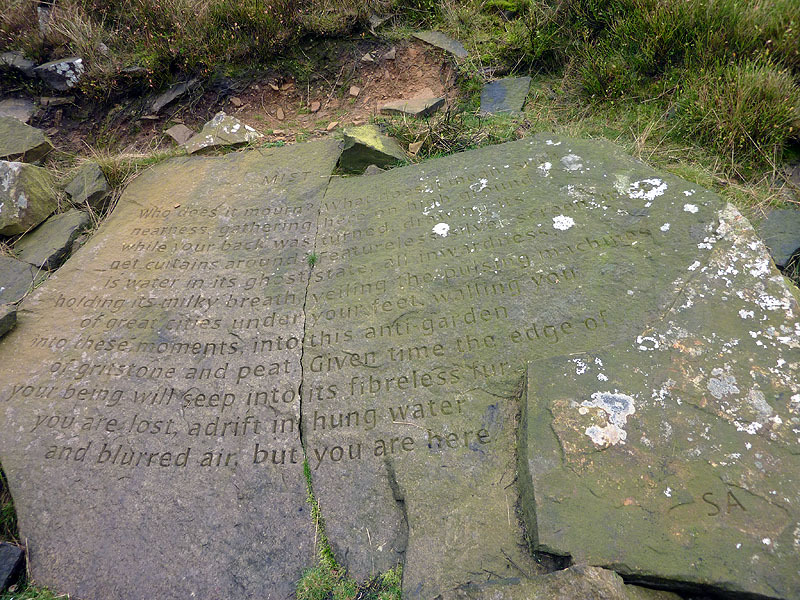 The Pennine Way is an obvious continuation, of course, but there is a much more interesting way through the south Pennines, following the Stanza Stones, a set of six inscribed tablets each bearing a verse by Marsden-born poet Simon Armitage. 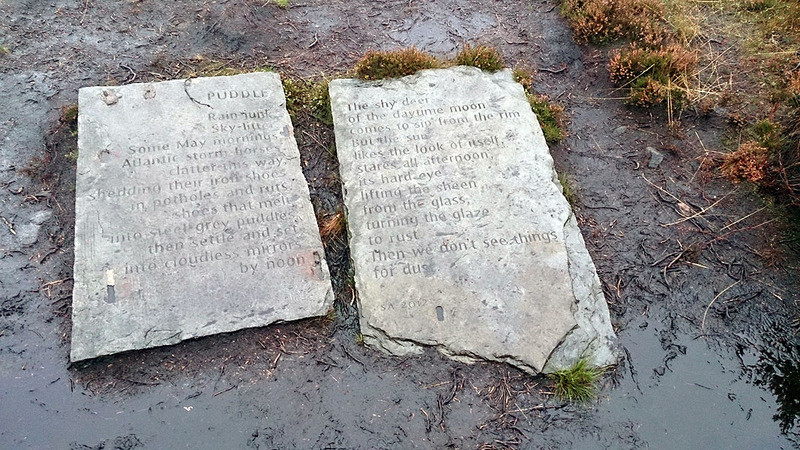 There is an official Stanza Stones Trail, and an alternative, slightly longer Stanza Stones Walk. I chose the latter, for no particular reason other than it visiting the birthplaces of Ted Hughes and the Brontes. 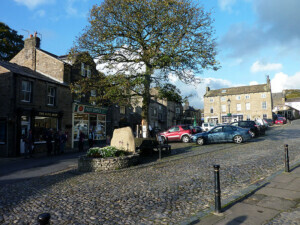 Both variants continue to Ilkley, where the Dales Way begins. Though it heads eventually to the Lake District, its first section leads up Wharfedale, a magnificent valley for walking, and more or less due north too. So that took me over the Wharfe / Ribble watershed, from where I diverted over the Ribble / Eden watershed, where for the purposes of this website the Northern Pennines commence. Both Stanza Stones variants start in Marsden, but to get there I would have had to have dropped down uneccessarilly from the hill above Marsden, so I missed the first half-mile or so, joining just up the valley in Netherley. 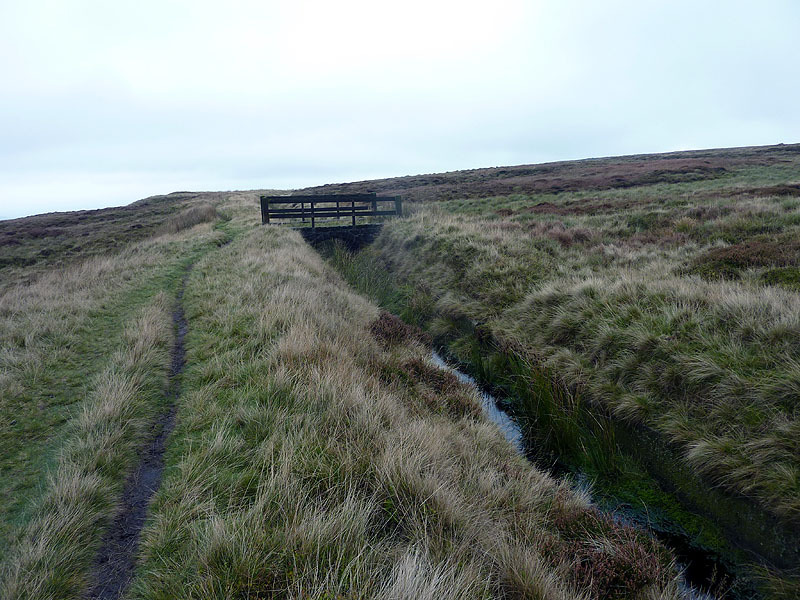 To get there, I had walked up to Deer Hill Reservoir and used its catchwater drain; many of south Yorkshire’s reservoirs have these features, with de facto access along them, and very useful they were to prove. It was perhaps the roughest day of the walk so far, walking just shy of north with a strong nor’easter, and rain most of the day – I was glad of my sister’s rain pants, my own still being in the cupboard at home! 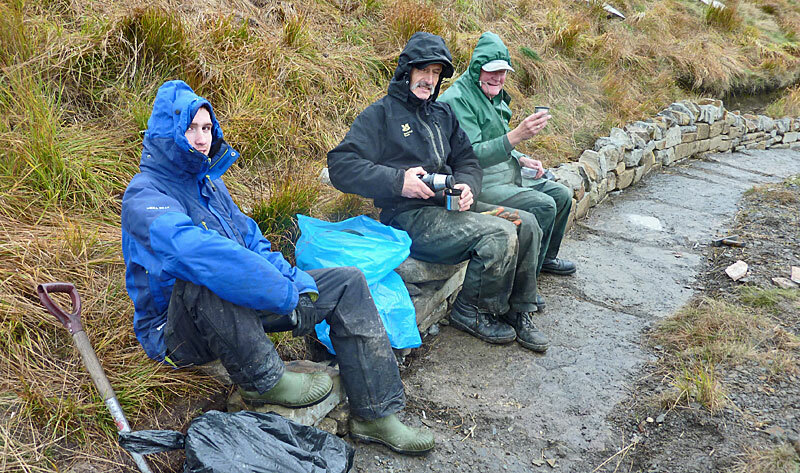 After the Snow Stone, there’s a good pack horse road over the moors, which was being fixed by volunteers. The lunch stop was planned to be the White House pub – my first visit since 1976 – but I was three minutes late. Good souls, they let me have a coffee all the same. 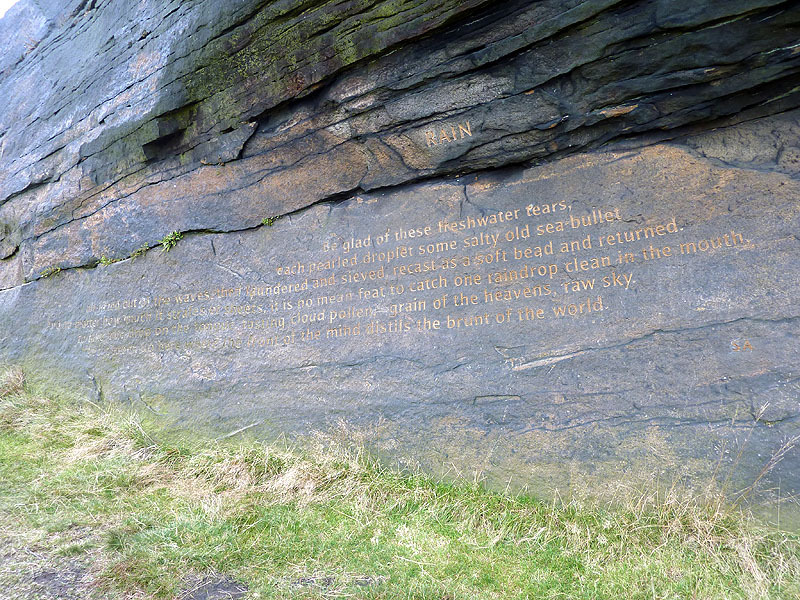 I then picked up the Pennine Way to the Rain Stone. The last stretch is over untracked moorland, which added a bit of mental exercise to the day. A much easier day than before, with the weather moderating after a wet start. 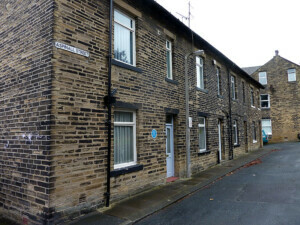 Mytholmroyd is just a pleasant valley walk from Cragg Vale, with Ted Hughes’ birthplace only a few yards off the route. After that it’s a climb up onto the moors, visiting some ancient cairns (and one brightly-painted trig point) before crossing over on a boggy path by Warley Moor reservoir to some old workings on Oxenhope Moor. Below a cairn here is the Mist Stone; there are several cairns, and I ferreted around a bit to find the right one. Soon, it was a simple matter of dropping off to the moor, into its village, across the Keighley & Worth Valley railway – alas, not working today – before farmland led me to the church at Haworth, where the Bronte siblings’ father was the local vicar. Alas, the weather forecast played me false: despite promises of overcast but dry, the rain set in as I was leaving Hebden Bridge on the bus, and continued for much of the day; an unwelcome distraction, with many miles to cover and the risk of not making sunset very real. The first section though was high farmland rather than moor, as my chosen route took me in a great quadrant to the north-west of Keighley. The first of two sharp descents led to the River Worth. Both this and the descent through Newsholme Dean were very pretty, but quite arduous early in the day. The latter is followed by plateau rough pasture, with countless (well seven) wall stiles to cross, and when just off the heights, I didn’t find the Walk at all easy to follow. 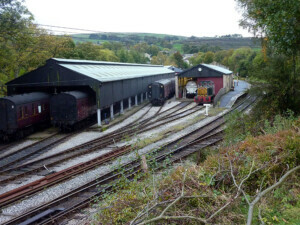 At length I descended down into the Aire gap, with railway and dual carriageway to be crossed. 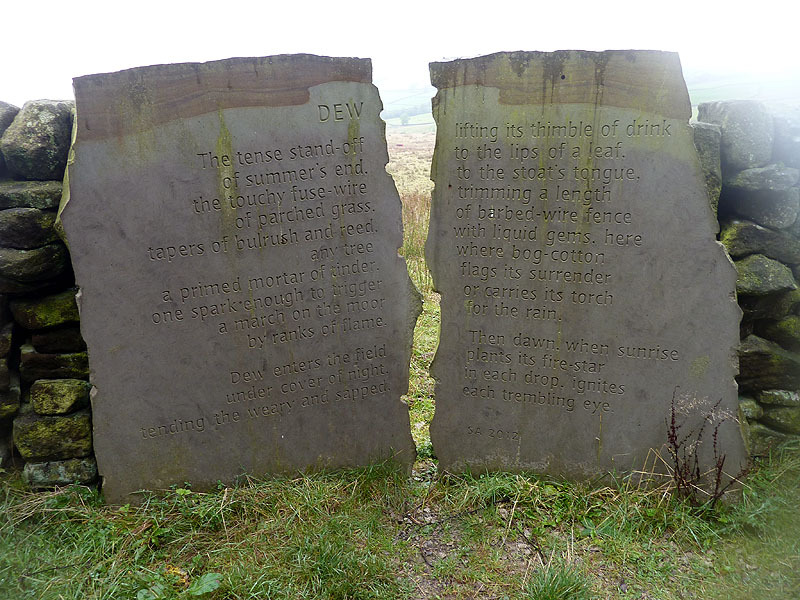 Lunch wasn’t in the calmest of locations beside a main road, but it gave the much-needed energy boost, as the afternoon was to be spent on Rombalds Moor, which hosted the three remaining stanza stones. The first, reached through a dense, dark pine forest, celebrated Dew – the first evocation of summer in the verses. Beyond, a glorious five-mile yomp across the top of the moor followed, which I found myself quite enjoying, perhaps because of the weather. At the Puddle Stones, I found myself spontaneously reciting aloud Armitage’s words. 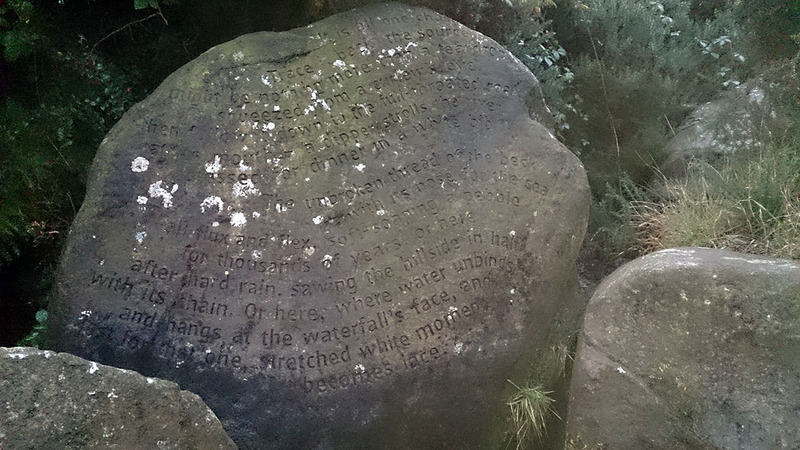 There was a bit of mist around, but it was easy to find the turn point, heading down through Ilkley Moor, the “poetry seat” beside Backstone Beck, and finally the Beck Stone itself, just minutes from Ilkley town, where the lights were just coming on. A total change in the weather, with a welcome mild autumn day, not a drop of rain, and a bit of sun towards the end. 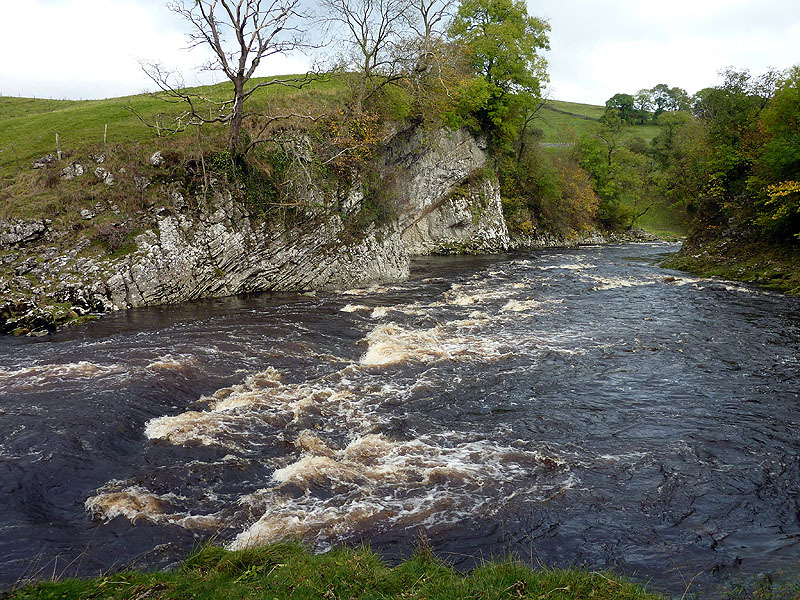 Today I was following the Dales Way, a popular long-distance path, which for this its first stage followed the River Wharfe closely all the way. 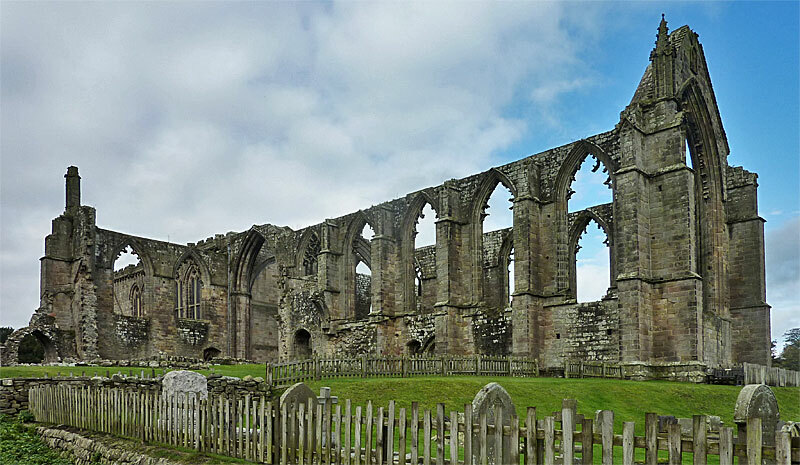 After Addingham, the first great highlight is Bolton Abbey, the ruins of a great Augustinian monastery. Beyond the abbey there are paths through the Strid Woods, popular with tourists at most times of the year. The countryside opens out beyond Barden Bridge, with views across to distant moors and the village of Appletreewick. Just after here, bridge repairs forced a road diversion into Hartlington. 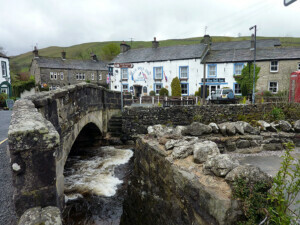 No repairs thankfully to the great mediaeval bridge at Burnsall, where I had time for a pint and crisps at the thriving Red Lion Inn. The last stretch saw limestone figuring more widely, both in a couple of scars (limestone cliffs) across the river, and the distinctive valley-shape just beyond, until the final loop into the busy gateway village of Grassington. The day after the 2015 General Election. Another triumph for greed and insularity over the public spirit. A good time to get away from news media. 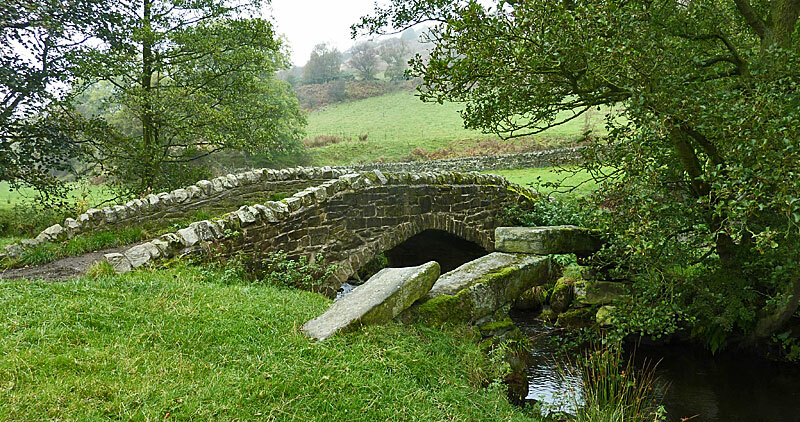 This simple walk by the Dales Way is a perfect little opener for a longer journey. This is quintessential limestone country, so there’s comfortable walking on grassy paths most of the time. A little bit of light rain was settling in, but nothing to make life uncomfortable. The heavens opened just after I pitched my tent in Kettlewell’s village campsite, and delivered a squally inch of rain that conveniently stopped just before I struck camp the next day; but I managed to pick up the lost sleep from the night before without too much difficulty. Though I had a long day ahead of me, I waited for the rain to ease, which about 10 it did. Even in the village it was noticeable how quickly the becks had swollen, and I had a little concern that the flood meadows of the Wharfe, the first half of my day, would be inundated. Things weren’t too bad though, and I enjoyed looking out towards Buckden Pike, a familiar fell from other visits. Strictly, I was in Langstrothdale now, but the dale-scenery still feels like Wharfedale as I continued to the dalehead at Beckermonds. Here, there is the first serious climbing of the day, up to the tributary-dale of Oughtershaw Beck, and with it a much wilder scene. Passing Nethergill Farm, I called rhetorically out ‘What about a nice cup of tea then’, only to see its sign offering hot drinks. It’s a major base for the Yorkshire Wildlife Trust, and they keep an open kitchen for passing wayfarers. I left the Dales Way at Camhouses, cutting up to the Pennine Way and then taking the Pennine Bridleway to my wild camp site. Trouble is, I didn’t know that was what I was doing: the product of using old maps on which the latter was not shown. Instead, there were vague paths across limestone country that I thought might be tricky going. And because I wasn’t looking for the Bridleway – something so big and distinct that mountain bikers and horse riders can’t miss it – I followed the invisible course of a mapped footpath that left me incontrovertibly on the wrong side of a wall. And over that, wandered about a bit, albeit in very attractive surroundings, Ingleborough dominating the view, until I saw a ribbon of gravel with two-wheeled machines on it. From there, things were much more straightforward, and I made good time where I thought I might have been suffering furlongs of clag. The limestone stretch immediately after Newby Head was especially rewarding, and would have had many options for a tent, but I pushed on to the path junction as planned, and soon found somewhere to settle in. 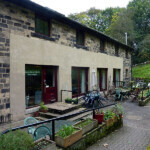 I stayed at my sister’s in Armitage Bridge again, for the night before the start. 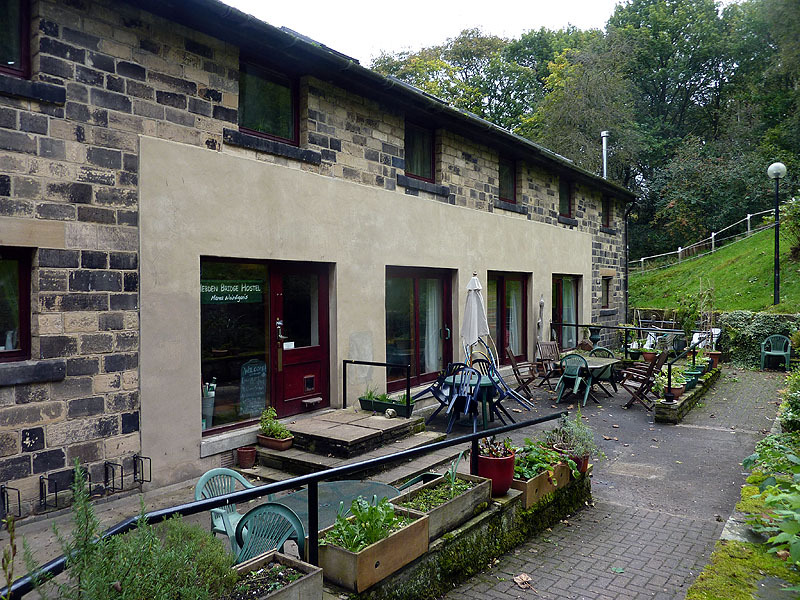 The next two nights were at Hebden Bridge Hostel, using the local bus services to and from Cragg Vale and Haworth; I’d long wanted to stay in this famous small town, and the hostel is the right place to sample the lifestyle. Ilkley has a few B&Bs and I chose the comfortable 1 Tivoli Place. 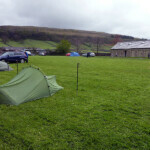 I carried the tent for the Dales section, using the Kettlewell camp site on the first night and having a wild camp on the second. 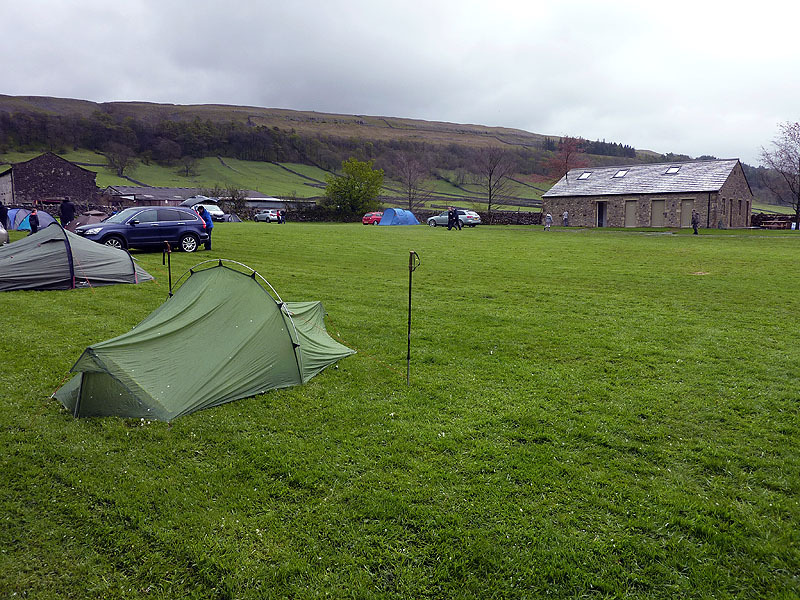 The Kettlewell site had only just re-opened and boasts an excellent facilities block – and a welcoming owner too, who insisted on making me a cup of tea when I got in. Wild camping is not legal, of course, but high on Dent Fell there was no-one around to ask, and with a late Saturday finish and early Sunday start it would have been a surprise to be challenged.